See my latest paper craft projects. Cards, scrap pages and 3-D items. Free tutorials. Attend card and technique classes. Ask me how you can join Stampin' Up!® and join the fun of leisure crafting or starting your own business. Purchase Stampin' Up! products via my on-line store. These two cards use the simplest form of stamping - ink to paper, with a tiny twist in each one. the first card is basically a monotone involving stamping off the same image without re-inking it. Simply stamp the darkest image at the front and then stamp the next 2 layers slightly above and to either side of the original image. You get a great effect of distance. 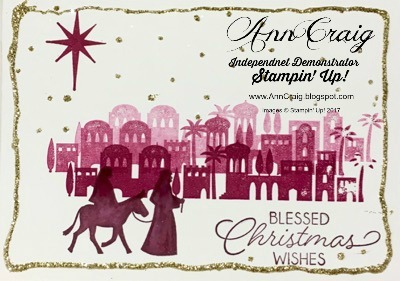 I used Berry Burst - on of the new In Colors from Stampin' Up!®, but added a little more definition of the Mary & Joseph stamp by using Fresh Fig. It is slightly darker but has similar tones. To brighten up the card I used the Fine Tip glue Pen to draw in the "stars" and the outline, then sprinkled Gold Glitter over the top. The next card used different colours for the layers and you can see how different it looks simply by choosing different colours. A slightly different layout - this time using the large "guiding star"stamp and changing the position of the town and greeting. The colours I used for this card are Lemon Lime Twist, Berry Burst and Fresh Fig - all from the 2017 - 2019 In Color range by Stampin' Up! The star is Crushed Curry. I found it better to start with the Lemon Lime Twist on this card and stamp over the top with progressively darker inks. Below you'll find a list of products used in these cards and if you need to purchase any of them you are most welcome to do so via my on-line store. Just select the image of the item you want and it will take you to my shop. 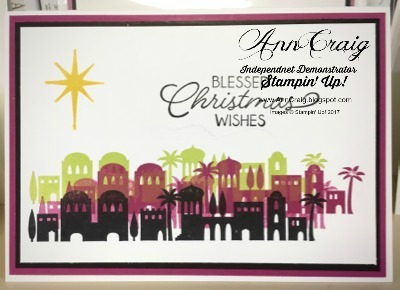 Designs by Ann Craig - Independent Demonstrator Stampin' Up!® unless otherwise stated. The content of the site is the sole responsibility of Ann Craig. Please enjoy it! Stamped images copyright 1990–2010 Stampin’ Up!®. Awesome Inc. theme. Powered by Blogger.